This is one of the best flavours I think we have ever made. We’ve tried chocolate truffle ice creams before, but the question has always been what is the best base to support them? A vanilla base can be a bit bland, and a chocolate base can over-power. This base, designed by JP and Christophe in our production,Â has just a whisper of chocolate – so light and delicate that it has amazed the customers in our shops over the last month or so. It complements the dark chocolate truffles perfectly. We used vanilla ganache truffles from the Skelligs Chocolate Company, which is based right here in Kerry. We found that using mixed-flavour truffles can confuse the palate, so we ordered 7 kilos of the one kind of truffle and started chopping. They thought we were nuts, but last week Sean received a phone call of thanks from the perplexed chocolatiers. 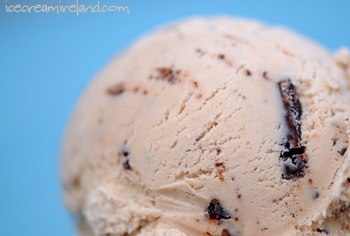 Apparently quite a few people who tasted this ice cream in our Dingle or Killarney shops, jumped in their cars and drove out to Ballinskelligs to visit the factory shop (which is now also home to Cocoa Bean) for even more indulgence! 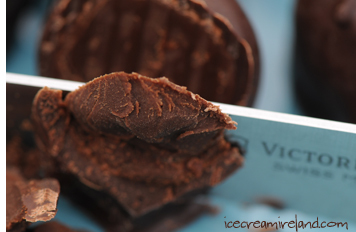 Melt the 70% chocolate in a double boiler over simmering water or a microwave. Take care – chocolate burns easily! Add the vanilla bean to the milk and bring to a simmer. Turn off the heat and remove the vanilla bean. Add the milk to the melted chocolate in small parts, mixing thoroughly until fully combined. Immediately beat the milk/chocolate into the egg and sugar mixture in a slow stream. Pour the mixture back into pan and place over low heat. Stir until the custard thickens (around 60C). Allow the chocolate custard to cool. Chop the chocolate truffles into small pieces, making sure you handle them as little as possible (to avoid them melting). Freeze the ice cream using a domestic ice cream machine, adding the chopped truffles once the ice cream has become semi-solid. Otherwise, cover and place in the freezer, stirring every few hours to break up the ice crystals. Again, add the chocolate truffles once it’s semi-solid (or they will sink to the bottom). This ice cream will only be as good as the chocolate you use. Find the best you can! To pasteurise the eggs, heat the custard to 73C and keep at that temperature for three minutes. Use a cooking thermometer, though! If the custard goes any higher than 76C, the eggs will scramble. Immediately cover and place in the freezer until cool. Oh my god divine!!! A definite 150% must make! Oh Kieran, you really do take the most delicious photos. Your new truffle ice cream looks amazing (as per the course with your ice creams). I can vouch for the divinity of this one! The only sin is that it is a limited edition and cannot be eaten for infinity. P.S. Young master Gatsby’s intrepid adventuring has Sorcha stalking our puss with a camera at every turn and lets just say she is a little camera shy! Sounds outstanding! I love the attention to detail. The concept of adjusting the base to better highlight the truffles is fantastic. I usually think of add-ins as enhancements to the overall flavor. Here you make them the star of the show. BTW, check out my blog http://icecreamfellow.blogspot.com. 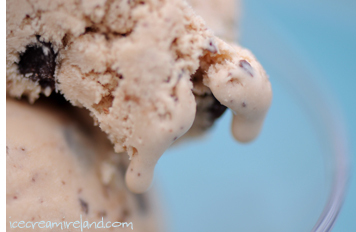 I just posted a recipe for curried pineaplle ice cream topping. Apparently I can’t spell. The recipe is for curried PINEAPPLE ice cream topping.